Even before the Aurora theater shootings last July, I had an interest in mass shootings that have sadly become a part of our American culture in the last 25 years or so. Why are they happening – is there something in the water causing some new form of derangement? Seriously, what is clear to me is that the frequency of these crimes are on the rise. Recently having become aware of the debate on the safety of using psychotropic drugs for treating mental illness I have wondered about the relationship, if any, they have to this type of violence. 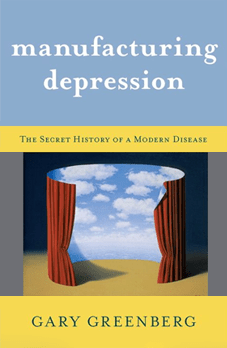 There is some great reading out there on mental illness and particularly depression and what we are doing about it in our techno-crazed culture, but the book that gave me the most insight was Manufacturing Depression, by Gary Greenberg. It was helpful to learn from other books the specific stories of people who have suffered greatly and even lost their lives while being prescribed psychotropics. It helps to read about the connections between the FDA who are in charge of approving the safety of these drugs, and the pharmaceutical corporations that manufacture and profit from them. But Gary Greenberg, a psychotherapist who is also a life-long sufferer of depression does a great job telling the story from a variety of perspectives, including his own. While he doesn’t believe that the drugs used to treat depression are as effective as the claims made by the manufacturers, he does not begrudge anyone for using them or their claims that they work. He does however take issue with the insistence that depression is a biological illness. Calling depression an illness mistakes the symptoms for a disease and imposes on you the patient, an identity of sickness placing you at the mercy of someone other than you for the cure. Only in the case of psychotropics, the drugs are not a cure but more like insulin, a life-long medication. In other words, if you buy into the idea that you need medication for your depression because it is an illness, you may convince yourself that it’s the only cure. But surely it’s not as statistics show that for any given treatment for depression, there’s about a 50% rate of relief of symptoms. I like this book because there’s no attempt to dogmatically conclude that all psychotropic use is harmful, because for some people it isn’t. But, in some cases it most definitely is and tragically so. It is important to acknowledge that people experience different results from taking them, although often times the doctors prescribing them do not caution patients enough as to the dangers. When people do experience bad reactions they are often mistaken for symptoms of the persons “illness,” instead of effects from the drugs themselves. Having gone through some dark periods in life myself, and having taken an antidepressant reluctantly for a couple of months, I feel personally invested too. During a dark period of time in the course of a two year therapy my therapist encouraged me to take an antidepressant. Although it made me feel less…well, much less, it seemed to leave me feeling too flat and emotionally numb. Not particularly enjoying the lack of feelings I told my therapist that even if they were painful, I’d rather have my feelings back, thank you so much. What I gained in the course of therapy was the ability to re-tell to myself the story of my life. Some spell that I had been living under was lifted. Not easily of course. It took a lot of time and courage to challenge the way that I had come to see myself and others, and to accept that many of my conclusions about past events, other people and my unhappiness were false. Perhaps for some people, and certainly for the insurance industry, this sort of treatment is too costly. At the time, I was fortunate to be able to pay my way to a point of making enough peace with myself and a better way to be in the life I have been given. I suppose my wish for anyone suffering in or from the diseases of our modern culture, who might prefer the quick fix, the pill, the surgery, the fast food, would be to know what the options are and beware of their consequences. Disclaimer: I am not a professional and you shouldn’t take anything here for more than it might be worth, deemed by an expert, which of course, I am not. And except for quotations, all thoughts and ideas and misunderstandings are solely my fault.